The gallbladder is a small, pear-shaped pouch that lies beneath the liver, in the upper abdomen. It stores bile. This fluid, produced by the liver, helps digest fat. 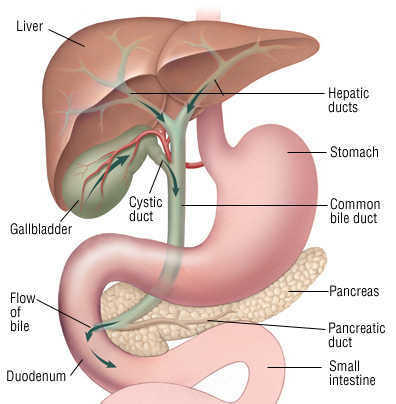 The gallbladder releases bile into the small intestine through the bile duct. This thin tube connects the liver and gallbladder to the small intestine. Cancer develops when abnormal cells in these structures multiply and grow rapidly. Most gallbladder and bile duct cancers are adenocarcinomas—cancers of cells that line the glands and ducts. Bile duct adenocarcinoma forms from the mucus glands that line the duct. It can develop in any part of the bile duct.